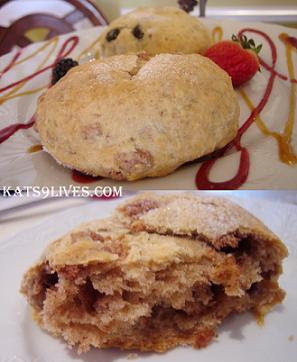 Kat's 9 Lives: Scarlet Tea Room : Feeling Dainty! Burumun and I both had the tea set and they brought us our Signature Fresh Strawberry Sorbet to start. Let’s just say that “scarlet” was a theme. I thought the sorbet was so-so because it was not very sweet. Strawberries must not be too ripe or in season because it was a bit sour and tangy for my taste. Still I am in it for the fun and ready for more. Our friend Hellobear opted out of the afternoon tea set and ordered the Petite Filet Mignon Santa Fe Salad. It’s Mesclin Greens, Black Beans, Kidney Beans, Corn, Cotija Cheese, grilled Sweet Pepper on the side, and Hickory Citrus Vinaigrette. The filet mignon looked very tasty and nicely cooked. We couldn't figure out what kind of cheese was in the salad but luckily I took a picture of the menu and just flipped back to find out. ^_- It was presented beautifully, full of color and different components to add texture. Luckily we didn't have to share the middle tower since we each get to choose 4 types of finger sandwiches. I chose the Chicken Tahini, Smoked Salmon, Roast Beef, and Mozzarella. The Chicken Tahini with shredded Chicken, Pine nuts, Chives, and seasoned Tahini Sauce was decent. It is like a Mediterranean Chicken Salad in a small finger sandwich. 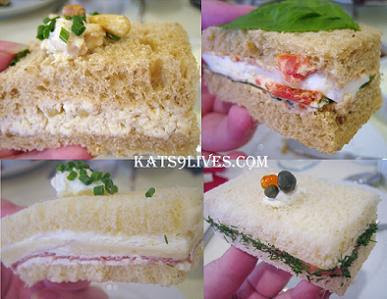 The flavor was very light and I really can’t tell the difference from other chicken salad sandwiches… I thought the Smoked Salmon with Chive Spread, Fresh Dill, and Capers looked very pretty in presentation with a Roe and Capers sitting atop the sandwich. Alas, a beautiful outer appearance does not reflect what is within. I thought the sandwich was plain and something you can easily make at home. The Roast Beef with Danish Blue Cheese with Arugula, Roast Beef, Shaved Red Onion, and Dijonaise was alright. It was mostly a thick creamy and cheesy flavor with a minuscule piece of meat inside. Again, you can definitely make this at home and load it with more meat along with some ripe Vine Tomatoes that would taste a whole lot better. The Mozzarella with fresh Mozzarella Cheese and Basil with Sun-Dried Tomato Spread. This was actually one of the more flavorful sandwiches and refreshing. The combination of flavors was well done and tasty. Burumun noted that she really enjoyed the Olive Tapenade sandwich. Don't worry we still had a dessert coming at the end, the Strawberries Romanoff. It was just fresh Strawberries and liqueur. I think they used Grand Marnier? Not too sure, but the cream was the best part. They do make a wonderful pair and bring out the sweetness of each other. I have to say that overall the desserts were unimpressive. Hellobear decided to order the Chef's special and it was much better than what we had. It was a Chocolate Tart with Honey. The presentation and portion was nice. I thought it was very rich, sweet, and heavy. This was much better than the dessert our tea set came with. At least we all got to try different things and share a wonderful luncheon experience. Looks really yummy! 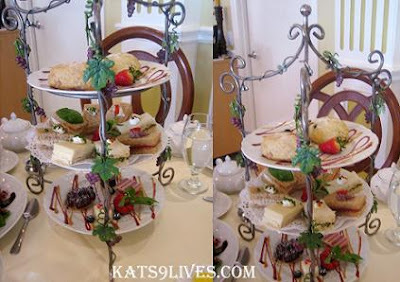 Afternoon teas are a great way to spend a leisurely afternoon. Thanks for the heads up. This place sounds like my cup of tea. Haha. 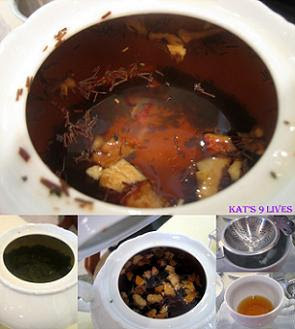 No problem Kathy L. I hope you have a wonderful time when you go ^_^ It's a very calming and relaxing time. thanks for this review! 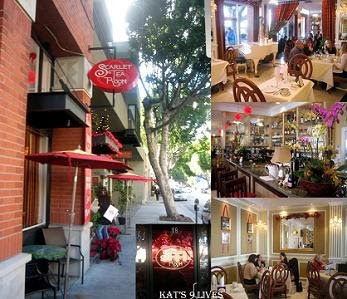 i live down the street from scarlet tea room but haven't ventured in yet. looks interesting and i am never going to say no to a tower of goodies!